Luong Dinh Dung is visiting Tucson with his film Father and Son, depicting the harrowing journey that shows the strength of a father’s love of his child. This epic and intimate film shows the strong sense of community families share along a glowingly picturesque river that becomes an awesome force of nature. AIFF - How did you get Do Trong Tan as Ca and Ngo The Quan as Moc to work so well together on film and how did you direct the young actor to give such a strong performance? Dung - For Tan as Ca, I did not explain the screenplay to him; he’s too young to understand the character in the film. I narrated it to him as though it was a story for kids instead. Similar to Tan, I suggested Quan not to study the script deeply and not to rehearse in advance nor ask others for advice on how to act. He might do so because of a fact that he has not married yet. Besides, I let Tan and Quan stay together for some days before shooting. They lived, played and learned some skills together like swimming or sailing. So they quickly love each other. When we did the real shooting, I often described the situation and let them act it out by their nature. Only when it did not match my ideas, did I make some adjustments. 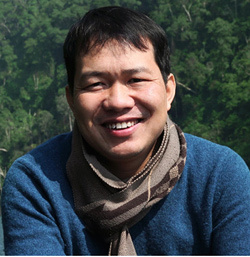 AIFF - What issues did you and Bui Kim Quy face writing the film? What were the challenges of working together and working out such a challenging story? Dung - The first difficulty was that we had to balance our creativity and budget limit. We always wanted put as much creative details as possible into the film to make the story impressive and interesting but this was an independent project that I had to cover the production cost by myself, so we had to take all the details into consideration to find out what we need to retain and the details that we can omit for cost savings. For example, the detail of rain on the hill is an indispensable detail, but the cost to bring equipment and crew to the hilltop is huge and difficult. Another detail is the families avoiding the flood at the top of the hill. We did consider that we might change that shelter to a lower location instead of the hilltop. However, it will reduce the characteristics of reality and excitement of the film. Finally, we still choose the first option. The second difficulty is to find out the unique way of telling the story. As a matter of fact, the subject of family affection is a familiar theme in film and has been exploited by many people. So we have to choose between to follow the familiar style of telling the story and to do our own style, that is, I let the story unfold as naturally as in our daily life, so that the story develops itself. I am like a person who holds the camera and captures the life of the character instead of asking them to follow what I want them to act. Feelings and climax depend on each of the audience. And that’s what I did in my movie. AIFF - Before shooting the film, what did you and cinematographer Ly Thai Dung discuss about the difficulties and artistic style of shooting in remote locations and contrasting that with the city? Dung - We discussed about the remote locations of the hilltop and river and the harsh weather, because the rain and the flood in this area were unpredictable so we all agreed on the flexibility of the scene, as well as be ready to adjust the script a bit to fit with the current situations on the setting. I also expressed my desire to capture the true nature with DOP Ly Thai Dung, so that we could prepare for the scene. And luckily we did that after many failed attempts. We use most of the natural light to make the film more real. Also, we agreed to use a variety of wide shots to portray all the beauty of nature in those locations. And we restrict doing CU shots, so actors can act in the most natural way. All the shots in the mountainous area were beautiful and dreamy while shooting in the city was done as real as a fact in life. AIFF - What does this film mean personally for you, it feels like your film was made with great care for subjects that you dealt with? Dung - The incident I saw when I was a child is one of those reasons that urge me to make this movie. There was a son holding a wooden bar hitting his father’s head until he falls down. At that time I painfully felt the sense of powerlessness. In Vietnam society today, the act of violence from the parents, children’s mistreat to their parents, family separation happen every day. I wished that I could have done something to make this society better. Another powerful reason of mine was because of my mother. My family lived in poor mountainous area and we never travelled by the airplane at that time. My mother kept wondering how it would feel to be on a plane flying high in the sky. Unfortunately, she passed away several years later before she could do that. It was the dream of hers as well as mine. I also had a chance to catch the delightful eyes of the children looking up to the sky when the airplane went pass. All those things drove for me to write the story and to make this movie. And until now it’s my deep belief that my movie has contributed to create huge impact, calling people to cherish family relationship, provoke affection inside every human being not only in Vietnam, but more in global term. AIFF - What scenes were the most enjoyable, or satisfying to shoot, if you had to choose one or two? Dung - The first impressive scene is the father and the son sitting together on the driftwood with a flock of white birds flying high on the sky as a background. It is extremely peaceful and tranquil but at the same time shows the latent ferocity and ruthlessness of nature. The second scene is the one of the blind man appearing gradually on the hill, carrying five kids on the bike on his back. It evokes unforgettable memories in those audiences who used to live in the mountainous area of Vietnam.